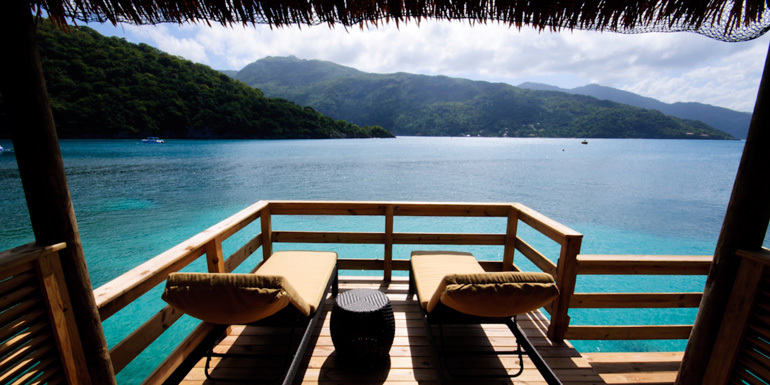 Located on a quiet stretch of Haiti’s northern coast, Labadee — Royal Caribbean’s private peninsula — feels secluded. Spread out across 260 acres, the property is a veritable amusement park that’s open exclusively to cruisers. You can book a shore excursion here — including boat and kayak tours, snorkeling excursions, personal watercraft adventures, parasailing, and visits to tiny, quiet beaches — but there’s so much to do that you certainly don’t need to plan anything beyond a day at the shore. Lunch on Labadee is BBq ribs and chicken. 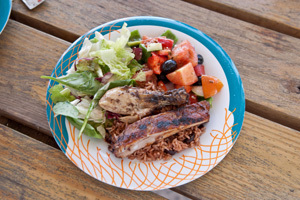 The beaches on Labadee are lovely and long, but the food — barbecue fare prepared by the ship employees using equipment and ingredients they take off the vessel — is disappointing compared to what the ships usually serve. Buffets might include barbecued chicken and ribs, burgers and hot dogs, potato chips, corn on the cob, and potato salad, but none of it is as carefully made as the meals onboard. Desserts include fruit, cookies, and banana bread, and drinks — from frozen rum cocktails to bottled beers — are sold at bars around the island or can be delivered to your lounge chair or hammock. Cabanas – Sure, you can grab a pair of lounge chairs for free, but so many cruisers feel that the cabanas on Nellie’s Beach are worth the splurge that they sell out quickly. Your palapa-topped, open-air bungalow comes with a cooler of ice water, towels, floats to use in the ocean, and the service of a beach attendant, who will even bring you lunch. Some cabanas sit up on the rocks over the water, while others are set back on the beach. But they all offer shade and give you a little space from the crowds. $225. Artisan’s Market – This shopping area sells Haitian crafts and hosts local performers, who sing and dance for guests and offer a taste of the local culture. Arawak Aqua Park – This in-water park is made up of the Dragon’s Splash Water Slide, as well as trampolines and inflated water toys in different shapes and sizes. Guests can pop in and out of the park at will. Free. Luc’s Splash Bash – Designed for smaller kids — those 5 and under — this playground has a variety of water-based amenities, from fountains to a “tree” of buckets that rotate, filling with water and dumping at random. On a steamy afternoon, it’s a welcome escape from the hot sand. Free. Dragon’s Tail Roller Coaster – This roller coaster — yes, an actual roller coaster — curves through Labadee's rain forest, with spectacular views of the sea and the ship. Climb into one of the two-person carts for a 5-minute ride through the jungle. $34 for two people. Dragon’s Breath Zip Line – Billed as the longest zip line over water in the world — at 2,600 feet — this high wire is set 500 feet over the sea. Go early to beat the heat: In July and August, for example, Haiti has average temperatures of 90 degrees Fahrenheit! $95. 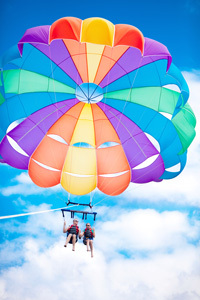 What do you like to do in Labadee?